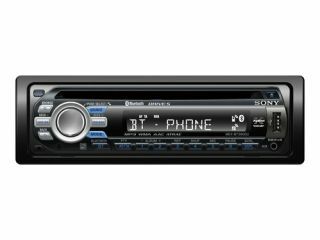 Sony’s shiny new MEX-BT3600U in-car CD tuner and stereo comes fully equipped with a USB port to plug in your digital music player. It's also fully Bluetooth-enabled, for safe and happy handsfree phone calls. “The in-dash head unit links wirelessly to the growing range of mobile phones from Sony Ericsson and other manufacturers that support Bluetooth connectivity,” Sony informs us. The stereo features a sensitive, high-quality microphone with echo cancellation technology concealed behind the head unit’s front panel. This means that “the other party’s voice is heard with crystal clarity through your car speakers and the music is paused automatically when a call is accepted and resumes when the call is ended”. The unit also has a front panel AUX input that allows you to connect any old player. Even an old cassette-based walkman or MiniDisc player (remember those?). Pricing is still to be confirmed and the Sony MEX-BT3600U will be available in the UK from May.